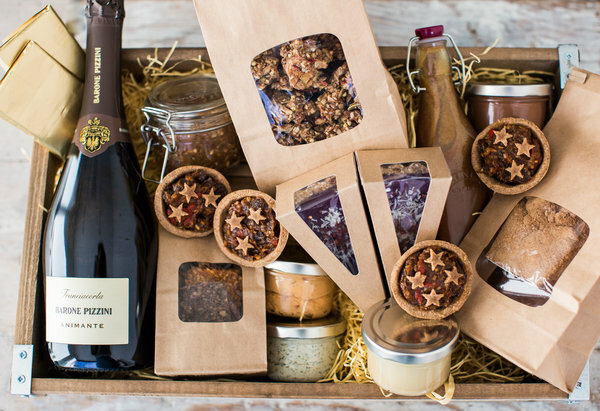 Looking for a delicious, healthy, flavoursome Christmas hamper? Choose between Standard and Deluxe Hampers by the NAMA – Artisan Raw Foods, the top raw foods restaurant in London. Treat someone special or enjoy a healthy indulgence this Christmas. Prosecco; 2 mince pies; Christmas cake; Nut cheese; Raw sprouted crackers; Raw chocolate bar; Le Benefice Sultan Herbal Speciality Tea; Raw fruit chutney. Organic Champagne; Chocolate coconut manna; Raw chocolate making kit; 4 Mince pies; Christmas cake; 2 Nut cheeses; NAMA's signature salad dressing; Raw sprouted crackers; Raw fruit chutney; 2 Raw chocolate bars; NAMA's grawnola; Le Benefice Sultan Herbal Speciality Tea. 85% of the products are made by NAMA team. All ingredients are from a high quality source and organic wherever possible, ensuring a higher mineral content in the ingredients. Because items have not been heated above 45 degrees, there is a much higher nutritional content due to the fact that the enzymes are preserved in the food. NAMA replaces dairy, wheat and refined sugar with other more nutritious alternatives such as for example, nuts, seeds, coconut sugar and dates, with the added advantage of these ingredients being suitable for those with gluten and dairy intolerances. All items in the hamper that can be enjoyed by raw foodie and non raw foodie alike. Take sprouted crackers – which taste like baked crackers but have the benefit of being nutritionally packed as opposed to the cooked variety. The raw chocolate is equally hard to distinguish from the non-raw counterpart, with the advantage that raw chocolate doesn't contain dairy and is made with natural sweeteners. Rest assured that the food won't go off even if it's raw: the cheese will last around 2 weeks, the chutney around 3 weeks; sweets can stay for 2 weeks in the fridge.